A few days ago on the news I saw a story that caught my attention. The Marine base at Quantico, VA had decided that they needed to build new housing for the families that live on base. They were working with a developer to do this. In the process, they were faced with an interesting problem. The Marine base currently was housing families in vintage Lustron homes. These homes were built in the mid 1940's out of metal sheets - walls, floors, ceilings, built-ins, cabinets - everything metal. The exterior were painted in a variety of mid-century pastels. I had to chuckle as they interviewed a Marine about his pink Lustron house. At any rate, much to their credit Quantico recognized what a slice of American history they have. To that end, they are now taking proposals for the dismantaling and removing of 58 of the Lustron houses via their very interesting website. The houses themselves are free, the buyer covers the cost of removal (they say they have original assembly manuals available, so it seems you just disassamble them in pieces). It appears they will give priority to developers who could assure them the houses would become a relocated Lustron neighborhood. They also mention using the houses for Katrina victims. Hurrah for the Marines. Hurrah for the developers of the new project. Hurrah for those people that save these oh-so-cute houses (and part of our history). Hey, congratulations to fellow Minnesota house blogs featured in this month's Twin Cities Bungalow Club's Small Home Gazette! Northland Stories, Top to Bottom, Minor Adjustments and Bungalow '23. Links to these blogs can be found in my home page's left sidebar (they are some of my favorites too). Do you pay for bids for work on your house? A few years ago, I was hearing noises in the walls of my house. I called a "pest control" guy that had fairly good comments on Angie's List (which I belonged to at the time). I suspected bats at the time, but honestly didn't know what it was and wanted a "pro" to fix it. He told me he charged $150 for a bid and applied that towards the work. He promised a 5 year warranty. I absolutely knew I wanted this work done, so stupidly I said ok.
Well, he came and listened to me describe the problem. Then much to my surprise he told me I didn't have anything in my walls because it was impossible for them to get in. He then held out his hand for the $150. When I told him this wasn't fair, he said he could do some investigative work, but there would be no warranty. I already had the $150 check written out and I was so surprised at what had just happened, I handed him the check. He left (the creep). We know now that I, in fact, did have something in my walls - mice coming in through a hole in the front doorstep. Upon doing more research, I was able to determine myself that the symptoms I described were typical of mice. And after a little more sleuthing, I discovered they were entering the walls via my front doorstep. That contractor simply didn't want the work...and made a living off of coming out for bids. From that day forward, I promised I would never, ever pay for another bid. Fast forward to today. I am getting bids for replacing my front doorstep. I generally get two bids for each project (three if the bids have a big range or one of the contractors give me the creeps). I try to be knowledgeable when the contractor comes, and I do my best not to waste their time in any way. I only request bids when I will be actually having the work done. Yesterday I had a contractor come out to look at the job. He seemed knowlegable and came with good recommendations. He said he would send me a bid later this week. We have snow on the ground here and it is cold. Too cold for concrete work, so this is off season for most companies and I figured it would be a good time to ask for bids. This morning I spoke with the second company I was hoping would bid on the project. They are fairly well known around town and the work I have seen that has their sign in front of it looks quite nice. Today the owner called me back and we set up an appointment. As we got ready to hang up the phone, he mentioned that he charged $25 for a bid. Now $25 is not an outlandish amount to ask. But I have a no-payment-for-bids rule. I told the contractor that and politely canceled the appointment. On one hand, they spend time with you and provide information as part of the bid. On the other hand, if you received 3 bids and each one charged....this could add $50 to the cost of the job (assuming the selected contractor applied the bid fee to the job). I can see it both ways. I run a small business and we get many requested for bids. Some of the projects we get, some we don't. Very occasionally we know they are requesting a bid to use as a bargaining chip in talking down the bid of another company. Oh well. We consider it part of doing business. It is built into the fee we bill our clients. I'm curious. How do other house owners view this topic? I never post more than once in a day, but this afternoon I discovered the answer to my local hardware store going-out-of business story. What a sad story. This family owned company has been in business since the early 1900's. This is the kind of place where you go in an describe your problem and they tell you exactly how to fix it....correctly. In a world where Home Depot and Menards are owned by huge out of state conglomerates and staffed by (for the most part) hourly employees who know little about how to restore & maintain an old house.....it is such a shame. Geez, and what about that evil bank? Hopefully there is a white knight out there that will make a timely appearance. This hardware store deserves it. Tomorrow afternoon I have the first of three companies coming to give me a bid on replacing my top, front door step. 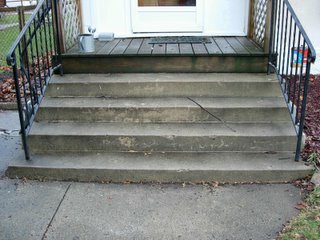 If you remember from my past posts, the top step was torn out approximately 6 years ago and replaced with this fine wooden platform. The gaping hole left in the foundation (undiscovered until two months ago) has become a highway into my house for mice. As soon as the weather is warm enough for concrete to cure, I want to be on some company's list. What things do I need to look for? What should I ask about? Anything I need to specify in the contract with the concrete company? From what I have been able to see, the top step stood separately from the remaining stairs. Is it possible to replace just this step? There are a few mysterious clues to what the old step looked like. 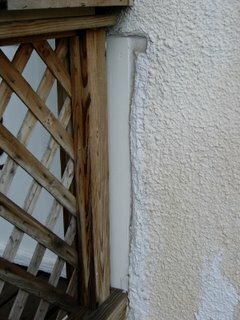 There are actual impressions in the stucco for what appeared to be hand rails. 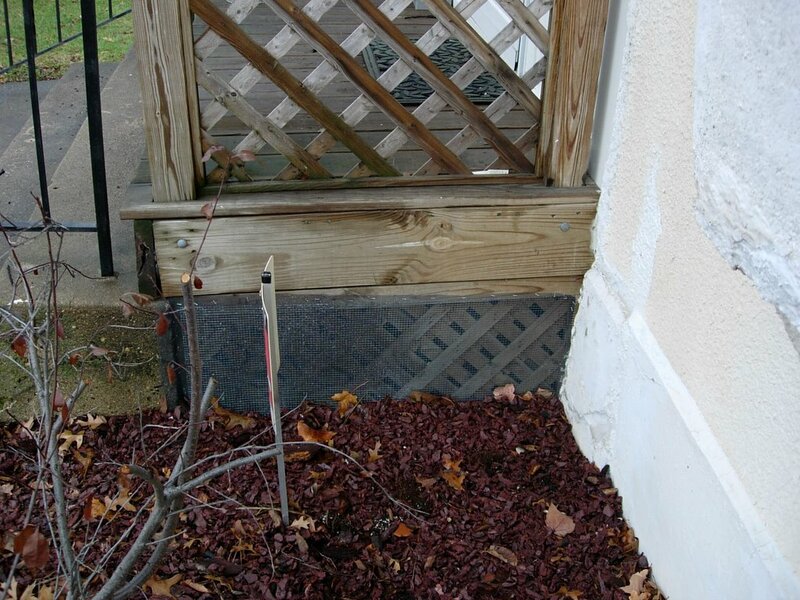 And near the foundation, it looks as if the top step was wider than the remaining stairs. Any ideas on what this looked like originally? My neighbors have some old photos of my house and I hope to be able to get copies of them before any work takes place in order to replicate (if I can see it on the photos) what was originally there. I was told there was a little front entryway that was removed, but I don't remember seeing those on the old photos (its been 3 yrs since I saw them at a block party) and I don't think the entryway was original. The other stairs are 80+ years old. 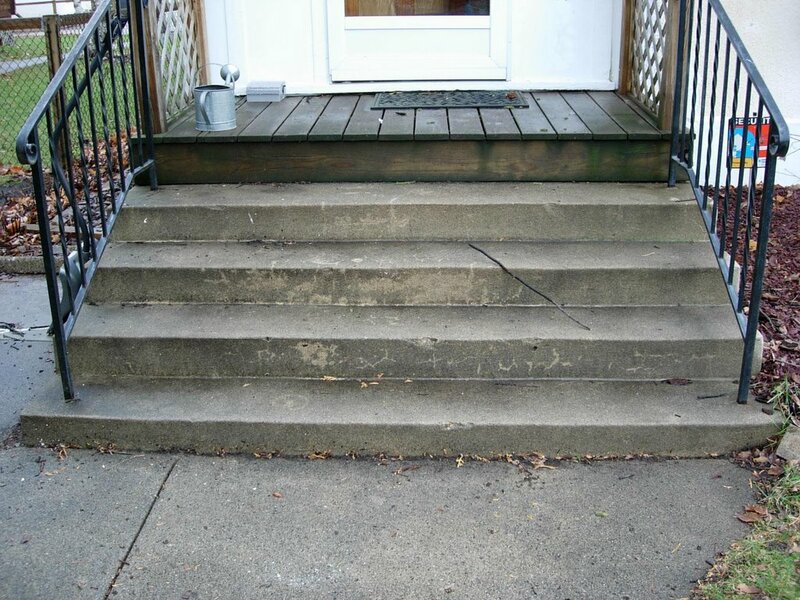 I want the new step to blend in and not have that new grey concrete look. Can this be done? How about patching the foundation. 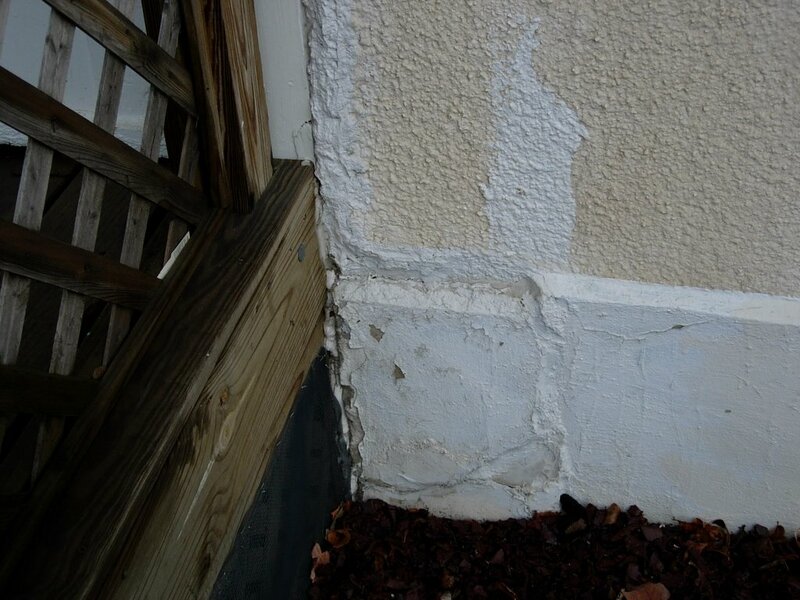 Do I need to have a carpenter out to make repairs first, or is sealing up the foundation wall enough? I have toyed with the idea of buying some copper mesh (StuffIt brand) and stuffing it in the space and then sealing it with some two part epoxy spray insulation. Is this crazy talk? And last but not least, any ideas how much this should cost me? And for those in the Twin Cities any referrals for reliable concrete companies? This afternoon I made a trip to my local paint store. I have been meaning to make a trip over there to have them mix a few more gallons of the oil paint I am using on my interior trim. Ok, I will confess. In light of the current push to phase out oil paints......I am hording. I've tried the new oil "subsitutue" enamels and wasn't impressed. I want a few gallons of the old stuff in my basement just in case. Anywho......the paint store was closed. So, I decided to take a quick little trip down to my favorite hardware store, St. Paul's Grand Avenue Hardware. As I neared the store, much to my surprise I saw "Going Out of Business. Everything must go." signs plastered everywhere. I found a parking spot in the masses of cars coming and going and went inside. There were bare shelves everywhere and customers snatching up the remaining deals. I found one of the salespeople and asked how long this had been going on. Her reply was a "few days" and then she put her head down and scrambled away. I heard another customer express surprise about the sudden closing to another employee and that employee was equally evasive....something about it being a "sad story" and "unexpected." A little later I asked another salesperson if the closing was planned. He was very vague and said the business was for sale and then couldn't wait to run away from me and avoid further questions. The employees had been told not to talk about the detailes of the closing. Huh. My guess would be that this means somewhere there is a lawyer involved. What hardware store would sell the inventory of the store if they were planning on selling the business? Something is fishy in Denmark. It was a cash only sale, so I picked up some paint stripper, garden gloves, oil, and copper wool (which is exactly why I shop here - who else carried copper wool?). To be honest, I was still so surprised I couldn't formulate a list of things that I could use. When I got to the checkout counter, I asked the cashier if the closing was sudden. (I figured I'd be able to get at least one of the salespeople to crack.) Again, she was vague. I said "oh, there is a story behind all this that we can't talk about...I gather ;-)." She said "a story will break in the newspaper soon, I'm sure." This leaves me very sad that we are losing one of those great old time hardware stores.....and very curious as to the conditions surrounding it. Most mornings I take a break from work and walk down to the local coffee place for a latte. I use this walk to keep tabs on the neighborhood. For the past week, I have had my eye on a remodel project a few blocks from my house. There is a big dumpster in the street that is being filled with old house stuff. In my neighborhood, this means old bungalow house stuff. A few days ago I slowed down enough to briefly inspect -without drawing attention to myself - what was in there and spotted two bright yellow cabinet doors. I toyed with the idea of pulling them out, but it felt it little weird. So, today I was walking by and spotted them again. And then....I heard a saw going in the side yard of the house. It was the contractor working. I walked up the sidewalk to the house and told him I had an odd question for him. He looked at me kind of funny and braced himself. 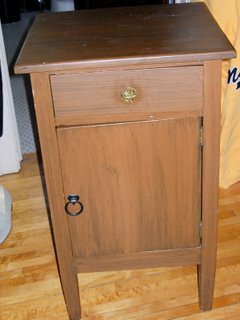 I told him I had spotted the cabinet doors in the dumpster and was wondering if the homeowner would mind if I took them. He was amused and told me that were mine for the taking. They are fairly large doors. 19.5'x30.5". They are birch. They match the design of my existing kitchen cabinets (inset doors with a beaded panel). The strange thing is that they only have one coat of paint on them. 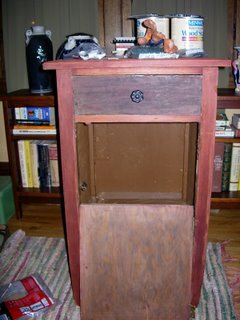 Under that coat of paint there is no finish (shellac or varnish). There are faint remnants of a grey paint. These doors look like they have been stripped once already and then repainted. They are in good condition. Anyone that has ever gone to the work of stripping cabinets will tell you that those cabinets would end up in a dumpster over their dead body after they went to all that work. 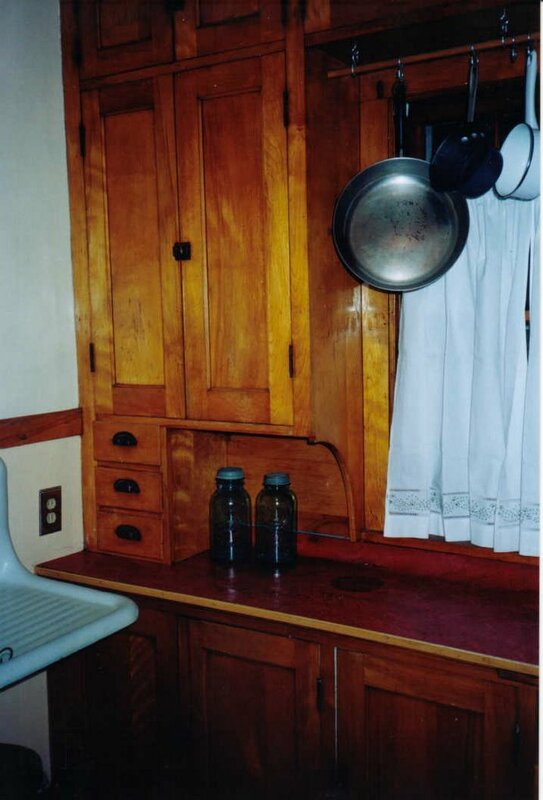 So, we know there is a story behind these cabinets. 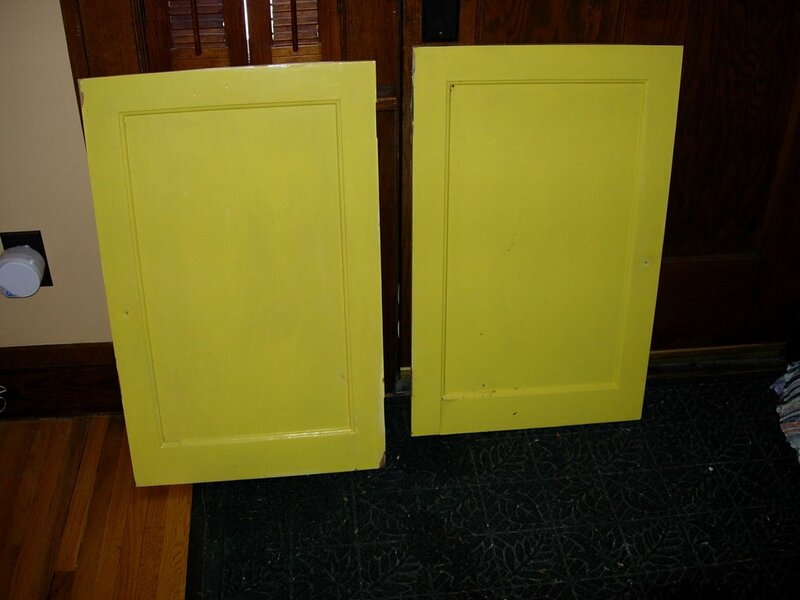 At any rate, I have high hopes that these doors can be worked into cabinets that I will have built for my kitchen (to match existing original cabinets). And thanks to some ambitious soul bringing them back to tip top shape should be a breeze. I plan to strip off the layer of yellow paint (attractive, isn't it?) and apply three layers of amber shellac. I spent a few days in Florida for work....and then a few days catching up again once I returned. 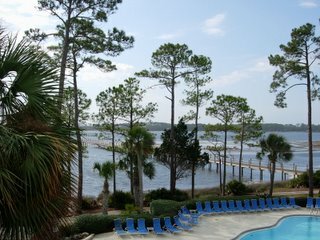 Every now and again it's nice for a girl from MN to get away from the old house, snow, etc. and enjoy some time tanning in the sun on a golf course and the beach. (oh, and of course working). A few months ago (ok, last summer) I found a little, ugly telephone stand for sale at a local shop. It was cheap. $28. It was really, really ugly. But it was also really, really solid. I sensed there might be a treasure underneath all of the paint. Lovely, faux woodgrain, brown paint....I might add. Topped off with some cheesy brass drawer pull and a heart shaped door ring. So, I bought it. I've spent some time over the past few months stripping off many layers of paint. I've been doing this in between other things, so the progress has been.....um......slow. At any rate, I'd thought I'd show pics of what I have discovered thus far. I had expected to discover oak underneath all of the paint. This little stand weighs a ton. What has surprised me is that the stand appears to have been originally stained red and green. The base, red. The door & drawer, green. It's not paint, but stain. Kind of cool. A little Mission; a little Folk Art. It also appears to have been handmade. This humors me a little because those colors fit right into my house. My living room is green, amber and red. My dining room is amber & green. My kitchen is green and red (I have a thing about one color from each room carrying into the next room). The little stand will most likely hold my phone in my dining room. As you can tell, I still have some paint stripping to do. I've found stain that match the original colors to even things out. I've also replaced the hardware. I'll post again when I finally finish the piece. I have been slow to post about some of my most recent house work. There is a reason I have been delinquent. In love with my new ipod. Over the past year, I have read numerous posts from other housebloggers talking about how they cheerfully and efficiently finished countless house projects happily listening to their ipods. I became convinced that this was the key to continued progress on my own house. Whistling while I worked, so to speak. So, I ordered one. Free shipping and engraved with my name ;-) A thing of beauty. Since it's arrival, my primary goal in life has been to fill it with music. Every waking, free hour has been devoted to the singular task of going through my cd collection and ripping songs to upload on The ipod. Not a small task as my cd collection numbers around 500. I like just about any type of music (except rap). I've uploaded nearly 1000 songs, and I still have 58 GB of free space. 58 GB; this makes me laugh. This thing is bigger than my last computer. Sorting through my cds has also been quite interesting. Before I moved, they were in alphabetical order (thanks to a detail oriented friend). But they were thrown into a box when I moved and now are in total disarray. I've had a little walk down memory lane with some of the albums (Doobies, Fleetwood Mac, Stones, Kinks, Miguel Rios, Bob Marley). Been amused by others (Michael Bolton - what can I say?). And have been outright alarmed at stumbling upon others (Bobby Brown - when on earth did that happen?). To date, a nice variety from ABBA to ZZ Top has been uploaded. And there is some evidence that it actually WILL motivate me to do some more work on my house. I regrouted my shower singing at the top of my lungs to The Carpenters, finished the last coat of paint on my bathroom window grooving to the Doobies (as an aside - who in the 70's would have seen a Christmas album in Michael McDonald's future? ), and stripped an antique telephone stand to My Sharona. This week will complete my first year of blogging. I started my blog on a whim last year after falling down my basement stairs , hurting my foot and being trapped inside for a few days. Its kind of fun to see the things I have completed and those that I haven't touched in the past year. Somehow none of it matches the Master Project List.